Here in Kansas, the leaves are changing, the air is chilly, the landscape is blazing autumn under a deep blue sky. It’s finally fall, my favorite season. Most people probably think that Kansas is one unending expanse of flat crop land, that we all live in Auntie Em’s farm house, and our next door neighbors are either munchkins or green-faced witches. I can’t speak for every place or every person in Kansas (maybe your neighbor really is a green-faced witch), but I can tell you a little about northeast Kansas. Here, believe it or not, Kansas is beautiful – rolling hills, woodlands, creeks, amazing sunsets, deep starry skies, and, yes, we even have trees that change color. It’s true that we don’t have rugged mountains or rocky coasts, we don’t have thousands of lakes that mirror the skies, we don’t have soft sunny beaches. But northeast Kansas has its own beauty. There are places here that remind me of driving through small New England towns, with their winding, hilly roads and flaming autumn trees. We have views that could be mistaken for rolling green fields in Ireland, speckled with white rocks and clumps of sheep. We may lack castles, but we have some beautiful barns. And we may lack a seashore, but, gosh-darnit, we have amber waves of grain! Northeast Kansas, in short, is a very pretty place. I finished my little silk gimp tree yesterday. On Monday, I’ll show you how it was made and give you some suggestions for making your own. Mine has an autumnal flavor to reflect the season, but you can adapt the process to any type of tree you like, and even to any supplies you have on hand. If you’re in the northern hemisphere, I hope you’re enjoying the onset of autumn! For those of you down south, may your spring be equally delightful! So pretty. I love this tree and your work as always is exquisite! Have a glorious fall day! Great you love your home place. Kinda makes it comfy eh. Yes, spring has really sprung here but it can’t make up it’s mind to stay between winter and summer. Like, last week it was 17C and yesterday was 36C ! We are having some nice days though in The Hunter Region. Thursday I was on a Manly ferry on Sydney Harbour, heading back to the city about 1/2 hr before sundown. It was absolutely glorious. I’m glad I don’t live in the city but I can appreciate the early evening light on the Opera House and Sydney Harbour Bridge, especially from the ferry! I’m a tree lover, especially the trees in the bush. Really like this one of yours. As a kid I had an uncle who had epilepsy. He couldn’t get a license or work. Rode a pushbike near and far with his camera. Died in his early 30s. Mum & Dad had hundreds of those old little black and white photos of his, in a bag. All trees, mainly gums. Perhaps they didn’t know, but I would spread them out on the double bed and look at them for ages. I was still very young. About 10 yrs after I was married, they had to leave the orchard suddenly. Much was thrown out, including ‘my’ trees. I still have a clear picture of them in my mind. Anyway, whose writing this post, you or me? Sorry to take over. I love your blog. Your little tree today is just gorgeous. How big is it? Fairly tiny, right? It’s 2.5″ high at its tallest point, Susan – so yes. It’s small. Oh, the Flint Hills – yep, that’s us! What? No Munchkins?? Don’t tell me that!! Terrific tree, tho! Very inspiring and great use of silk gimp. I too love autumn and trees. Your tree is so beautiful. I also love silk threads, but I am trying not to buy more threads since I have so many. Thanks for the inspiration you give each day through your website. 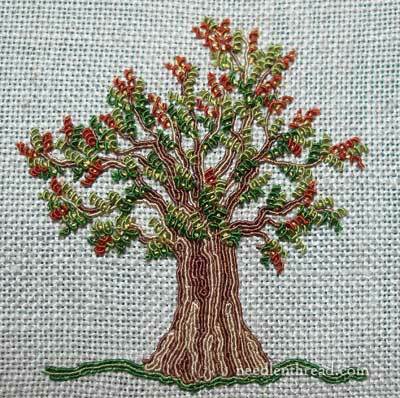 What a delightful project – and to see the new silk gimp used is a treat! Living in the Midwest, I must ask the question, will the tree stop at ONE season?….or perhaps, might there be a spring tree, a summer tree, or even a winter tree, if your part of Kansas gets snow? 🙂 Happy stitching! Just to let you know that here in South Carolina we are also having a beautiful fall. My favorite part of fall is that I can now open my windows and let the wonderful refreshing breeze flow in. The summer of heat, humidity,etc. is now gone and this wonderful time of the year without air conditioning or heat is such a blessing. The leaves are turning and falling, the acorns are coming down by the bucketfuls (ask me how I know!) the wildlife and birds are changing and preparing for winter and are a joy to watch……..anyway, down south we are loving it too!! Look forward to receiving your column every morning – such a talent you are!! Beautiful Mary! I love reading blogs when people adore where they live! Like Kath, I just adore living in Australia (although I’m on the other side of the country to Kath), and count my blessings daily. Oh, Mary – I love this tree. I’ve got to get to some surface embroidery. I’m so busy right now with ornaments, bookmarks and little stitches, all for holiday gifts – never mind the three samplers, several blackwork pieces, and a couple of fun things just for me. Yes… I am one of those with at least a dozen WIPs. Oh, well, what’s one more? I think I have to work on something like your wonderful tree. Oh Mary, your tree is so gorgeous! I wish I had the artistic eye that you do for interpreting life around you in fiber! You are truly gifted!! Beautiful tree! I love reading about the different seasons that are now beginning. Mary, what type of thread did you use to couch the silk gimp? Silk! Soie de Paris, to be precise. More on Monday…! Having grown up just east of Delia (for everyone else this is just 9 miles from St. Marys) I agree with your description of the beauty of NE Kansas in the Fall. Oh Mary, You just made this Kansas girl so homesick. I grew up in Wichita. I’m the only one who ever left, and it was to follow my husband. He first took me to St. Louis. Then we came to Texas where we have been for 29 years. I havn’t seen the beautiful Flint Hills since our tenth wedding anniversary 22 years ago. I would so love to see my Kansas but I have disabilities now that make travel near impossible. Talk about Kansas now and then for this homesick girl. Hi, Nancy – this silk gimp isn’t on the market yet, but it’s coming! I’ll let you know when it’s available! Congrats on your retirement! I wish you many happy days filled with all the things you want to do! I married a Kansasan from Hoisington and you are right Kansas is beautiful. Thank you for idea, very good as usual. Loved your story today, Mary. Spring here is just delightful, but we never get a proper autumn or fall – one thing I do miss at times. Beautiful tree it’s a delight!!! can’t wait for tomorrow to learn how you did that. Here in north London Autumn is upon us and nature is changing preparing for winter, the trees are changing colour with rich luscious autumn colours beautiful. You got NE Kansas right! Love this area so much. There is truly no place like home. We have traveled this country on vacation and it is great to see other places but always great to get back home to Kansas. The trees this week have been beautiful…. Most of the trees are still green here in the SW of England. Autumn is a slow season in our climate. Every year I plan to get to know the names of trees so I can see which order they turn. It’s not too late this year… Still, I love Autumn. It was Pushkin’s favourite season, too. Even though Autumn is very short and sharp in Russia. Forests of birch trees with their Autumn leaves are so beautiful you want to breathe them in. I love the tree. 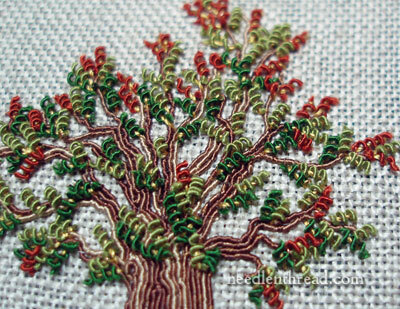 It pulls together the two things I love about embroidery: colour and texture. Your blog continues to be a help, an inspiration and something beautiful to look at. (We all need beautiful.) Thank you. I had to smile, gosh-darnit, when reading your description of your part of Kansas. It sounded just like you were writing about my part of New York state: Central, where the rolling green hills reminded my Irish grandmother of “the old country” and my sister, who has traveled the world, thinks it’s the most beautiful place on earth. Instead of sheep, we have cows and the trees are ablaze with the beautiful colors of fall. When we go for a ride in summer we end up going for ice cream. In fall, a ride takes us to pick apples or for apple cider. Thanks for giving me the opportunity to share my thoughts about autumn! Hello Kansas!! I’m speechless. Completly fascinated with your webpage, lessons, tutorials and enlightening words. I’m so sorry I have to read you with a spanish dictionary opened because I’m always slow and late, but it’s so worthy that I love it. I’m completly beginner but absolutly in love with learning about thread and stitch. thank you for your wisdom. From Chile with a linen, needle,thread and passion. Hi Mary, your tree is beautiful. Everything you stitch is a beauty. What a wonder gift. Do love that tree. Looking forward to trying this new thread. Thanks for the update. Previous Previous post: Thread Talk: Silk Gimp!